TwelveZeroSeven has combined analog cards with a “digital” greeting to create this innovative, yet retro lineup of Punch Cards. They’re totally tubular, dude! 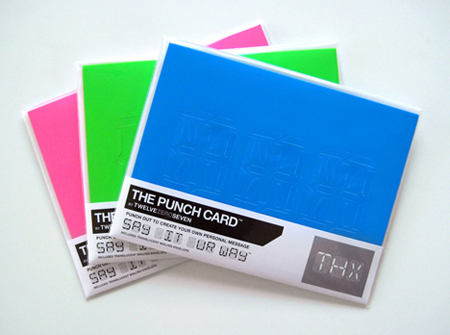 Each Punch Card has 48 perforations for you to punch out to create LCD style three digit greetings, such as “LOL,” “BRB,” “GR8,” “ZZZ,” “YAY,” and if you’re as big of a Star Wars fan as I am, “3P0.” Punch Cards are blank on the inside, partnered with a matching mailing envelope and are currently available in a trio of brilliantly bright colors: Hot Pink, Electric Blue and Neon Green. I really like the vibrant hues that TwelveZeroSeven picked for their first series of Punch Cards, but I’m sure that they’d like to hear your suggestions for their next wave of cards. 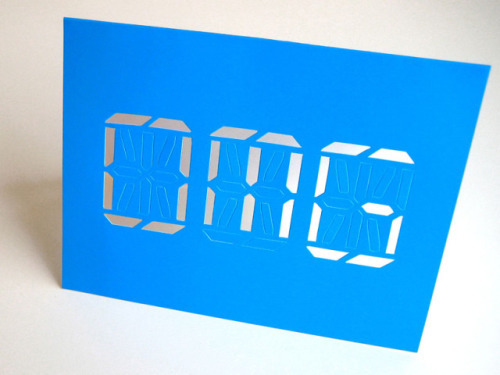 The Punch Card is a vibrant example of how even the most basic of everyday items can be reimagined for a new audience. Greeting cards already feature cash-holding pockets, singing sound chips, complex pop-up “3D” designs and other creative spins on the classic formula, but you might discover the medium’s next heart-warming innovation the next time you check the mail!